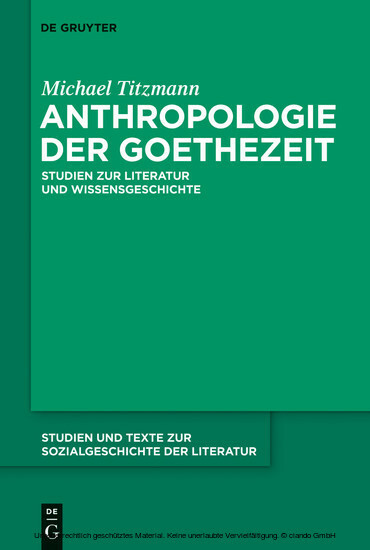 The thirteen papers in this volume span the period from the Early Enlightenment to the end of Romanticism and reconstruct the system of literature and thought of what is known as ‘The Age of Goethe’ from approx. 1770 to 1830. On the basis of a comprehensive corpus of texts from German literature, the papers illuminate not only their pre-conditions from the European Enlightenment but also the relations between literature and the theoretical discourses of (popular) philosophy, theology, medicine, anthropology and jurisprudence. Michael Titzmann, Universität Passau; Wolfgang Lukas, Bergische Universität Wuppertal; Claus-Michael Ort, Christian-Albrechts-Universität zu Kiel.